The new studio is almost finished (update coming soon), and I have been working daily in the new space to get Christmas gifts finished and ready to ship. One of the things I have been working on is a concept for a convertible leather cuff. This cuff can be worn as a traditional wrist cuff, or you can loop it around a scarf for a little something extra. I’ve had this jasper sitting in my collection for quite a while. I love the colors and patterns, but it was a bit large for a pendant or ring. I think it works perfectly as the focal point of the cuff. I am already going through my cabochon stash, and will be making and listing these in my Etsy Shop soon. With a new studio in the works, I am clearing out some extra goodies! I’m selling extra finished silver and gold chain. Shipping on desash items are just $1! Here’s a sample of the available chain. Upcoming destash items include decorative bezels for calibrated cabochons, base metal findings and beads. I had the pleasure of using two of the lovely cabochons I blogged about earlier as well as a stone I cut myslef to make some gifts for my cousin’s wedding. 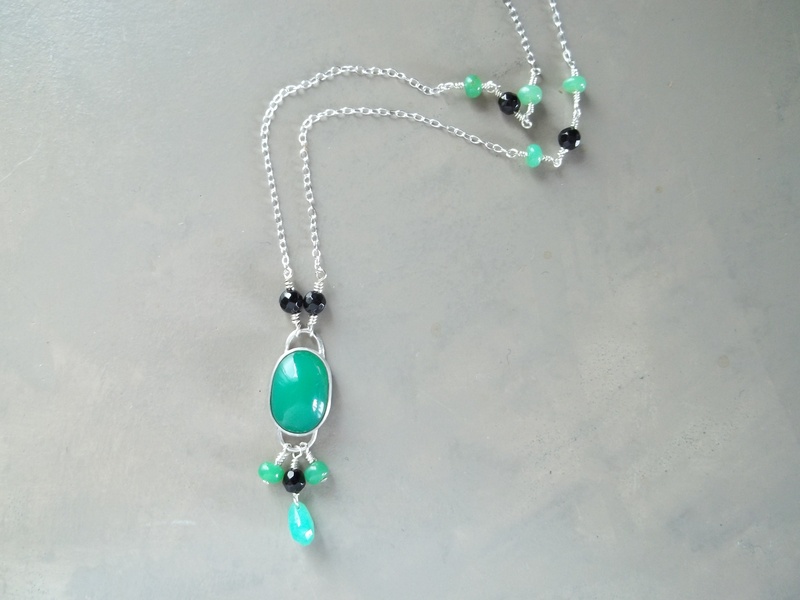 The beautiful chrysoprase was set in sterling silver and accented with black onyx and chrysoprase beads. This one was for my aunt, the mother of the bride. 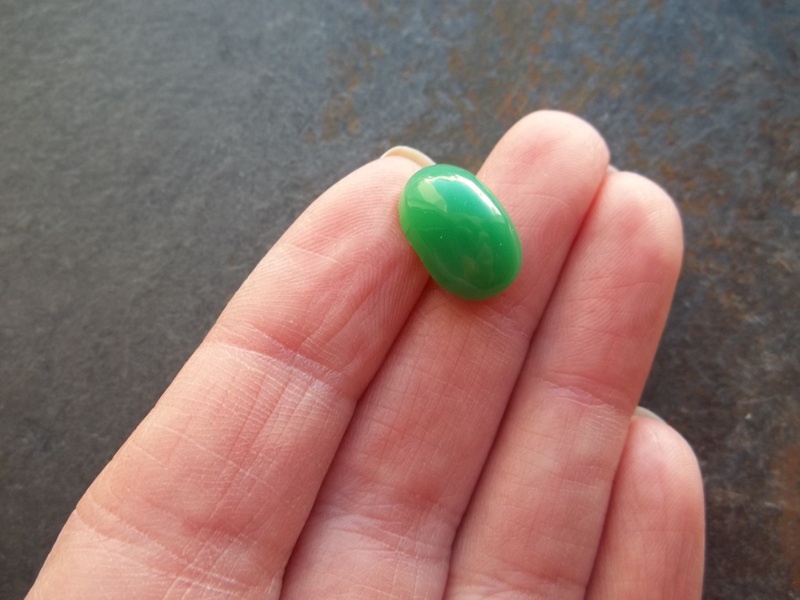 The chrysoprase was the exact color of the pattern in her dress. It was almost as if this stone’s color was lifted right off the fabric! 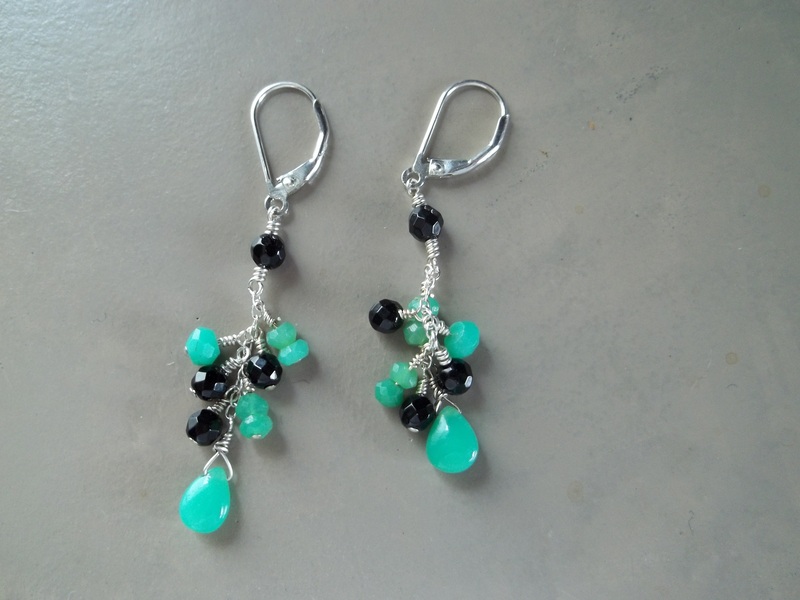 I also made some lever back dangle earrings to match. 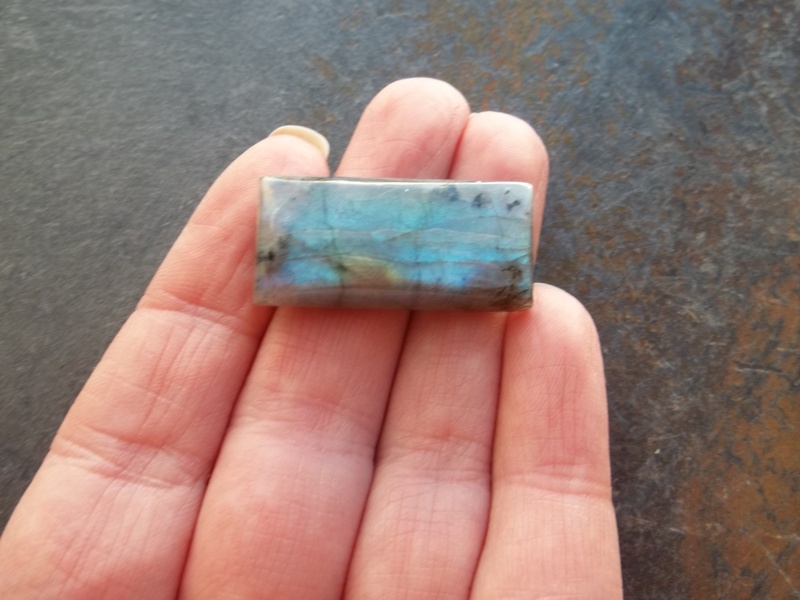 My aunt also selected the labradorite cabochon for the sister-in-law to-be. Her favorite color is blue, and the flash on this beauty won’t disappoint! I’ve accented the pendant with a bezel-set round labradorite and sterling silver balls. 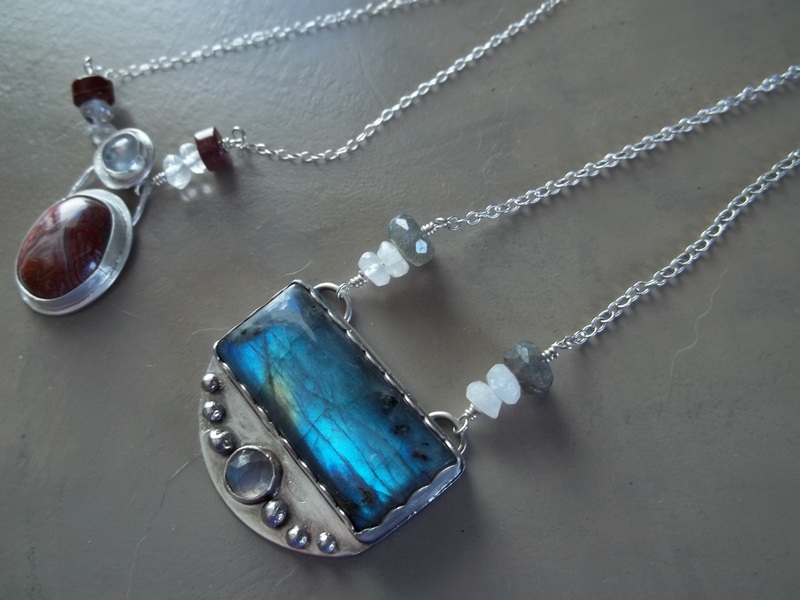 The pendant attaches to the sterling silver chain with moonstone and labradorite beads. I lightly oxidized the whole necklace for contrast. For the mother-in-law to-be, I made a necklace with a bezel-set laguna lace agate that I cut from a stash of rocks I inherited from my grandfather. It was one of the first stones I ever cut and polished. The agate is accented with a white topaz. 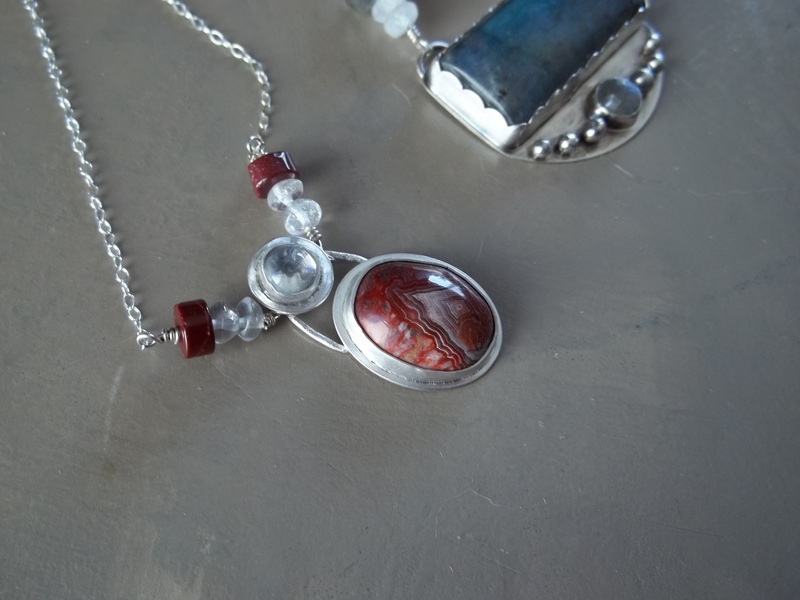 The sterling silver necklace attaches to the pendant with crystal quartz and red jasper beads. I will be posting more cabochons soon. All will be available for custom pieces! I made this pendant quite a while ago, but just wasn’t sure what I wanted to do with it. So, it sat on my bench for months. And months. I tried pairing it with a beaded necklace and hanging it from a simple chain. I modified the bail more than once. Nothing seemed “right”. Sometimes that happens. But I really liked the turquoise paired with amethyst. 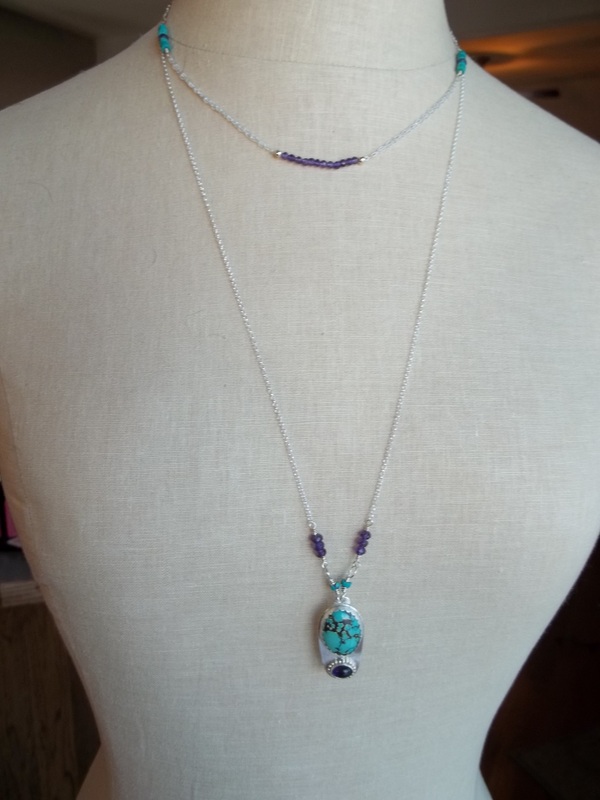 So while I was deciding what was “just right” I made this simple sterling silver, amethyst and turquoise beaded necklace. In the end, I decided to go with a longer length chain for the pendant and pairing the two necklaces up for a layered look just made sense. I think both necklaces have a nice Western look without being too cowgirl. While I am a born and raised Wyomingite, that sort of look has never been my thing. These necklaces are both available in my Etsy shop. I just received these lovelies in the mail this week. They are beautiful cabochons cut by Stones That Rock. I love the work that Ralph does and his wife MaryAnn, is super sweet. These cabs are available for custom pieces. 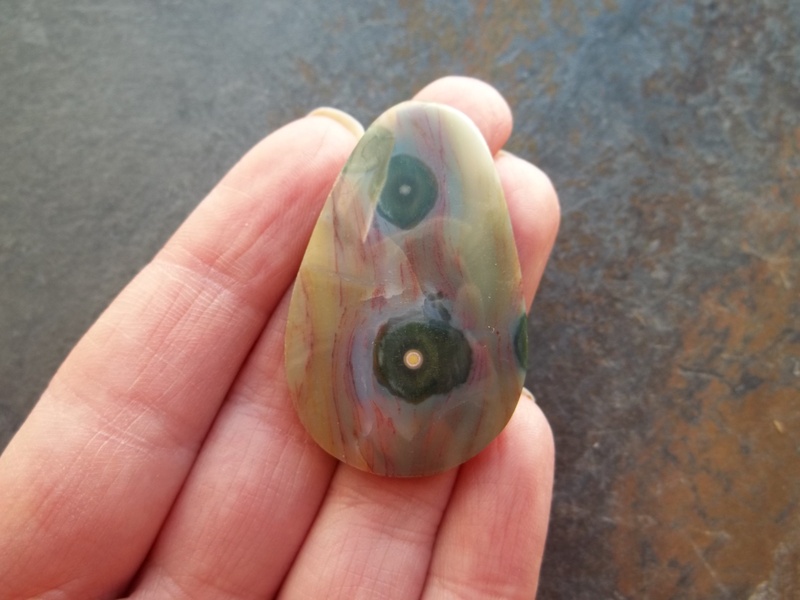 I love the green orbs in this stone. Beautiful blue flash. I think this would make a striking ring. What a statement! Love, love, love the gemmy green color of this stone. It screams spring! 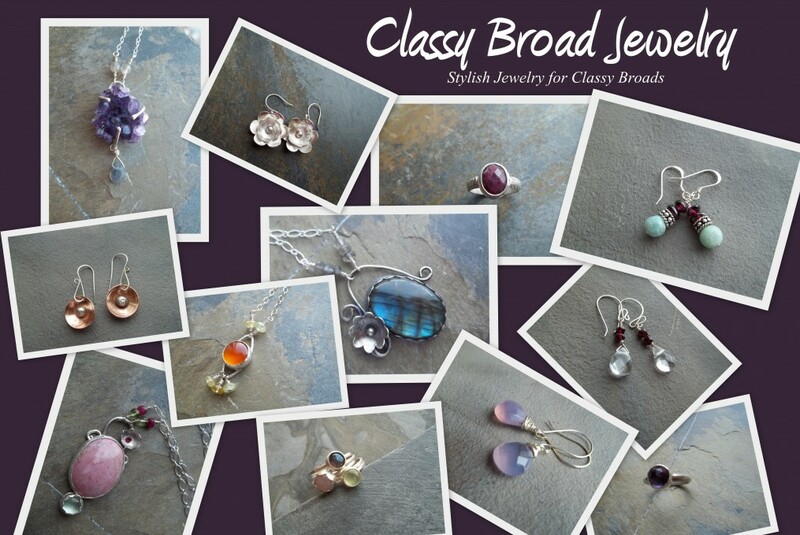 Welcome to Classy Broad Jewelry! 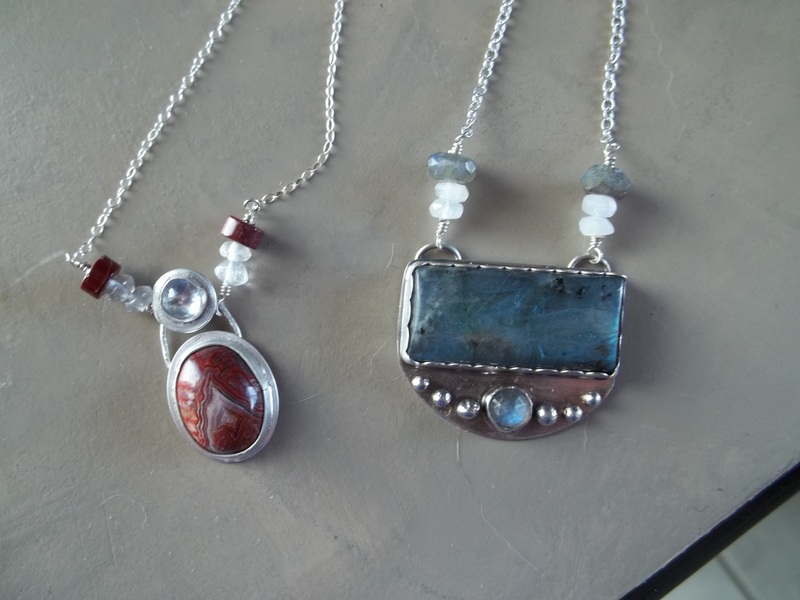 I am a geologist by training and a self-taught lapidary and jewelry artist. Here, I will be sharing my designs and creations as well as my favorite tips and tricks for taking your piece from rough stone to finished product. Please visit my blog for a sampling of my work and my Etsy Store for items currently for sale. I will also be listing cabochons available for custom designs. Thanks for stopping by. Please remember to like me on Facebook and follow me on Twitter for the latest updates.